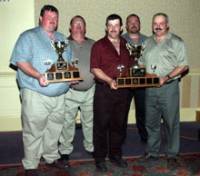 A Canadian Coast Guard Auxiliary team from Newfoundland and Labrador has been declared International Winner of ISAR 2003, the Fourth Annual Marine Search and Rescue Competition for volunteers. The competition was hosted by the Canadian Coast Guard Auxiliary (NL) in St. John´s, Newfoundland on September 26-27. Twelve teams representing the Canadian and U.S. Coast Guard Auxiliaries participated in various events ranging from dewatering pump operation to line heaving and from chart work to search planning.